While Rafael Nadal is unbeatable at the French Open and will almost certainly gain his 11th title this Sunday, we will have about the best final opponent to hope for on Sunday. Standing on the other side of the net will be Dominic Thiem, the only man to beat him on clay over the last two years. I’ll go over how the two have performed so far this French Open, what their recent H2H has been like, and then conclude with a description of tactics to look for + a prediction! Dominic Thiem hit his peak this clay court season with a comprehensive win over Nadal in the semis at the Madrid Open. Then he turned in two baffling tactical performances, losing to Sascha Zverev in the final and Fabio Fognini in the first round of Rome. In classic ‘Thiem’ fashion, he decided to play one more tournament right before the French, and competed in Lyons, an ATP250. He won three tight three setters in a row to take the title. Despite battling in Lyons, fatigue hasn’t been an issue for the young austrian. Thiem has been vigorous and aggressive throughout the French Open. And he’s had a nightmare draw! Young clay courter Stefanos Tsitsipas, Kei Nishikori, and Alexander Zverev, all have fallen to his sword. He was spared a match against Djokovic, and instead beat the unheralded and underrated Cecchinato in straight sets. On the other side, Rafael Nadal has turned in his average clay court season. That means he moved his loss to Thiem in Rome from last year to Madrid instead, winning literally everything else and holding onto the No. 1 ranking. At the French, Rafa has been fairly mediocre up until the semis, by his standards. (Of course, by anyone else’s standards he’s been exceptional) Last year Nadal didn’t give any player more than 5 games in a set. This year he’s been in two tiebreaks. In the quarters he gave up a set to Diego Schwartzman, before roaring back from a break down in the second after an incredibly fortunate day-long rain interruption. However, in the semis Nadal delivered an absolute clay-court masterclass. Many thought Juan Martin Del Potro would be a big threat, with his massive serve and forehand. 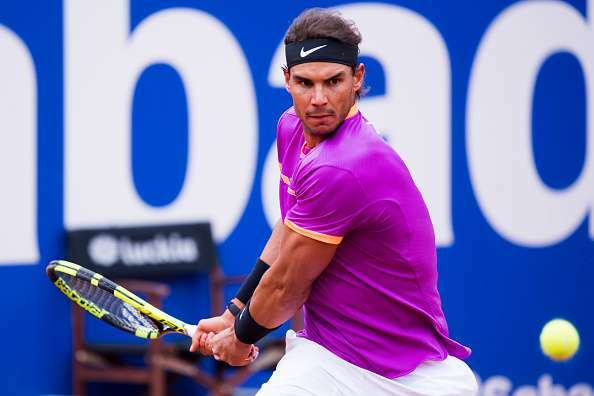 Instead Nadal broke his will in the first, and proceeded to run away with the second and third, winning 6-4, 6-1, 6-2. Dominic Thiem plays Nadal a lot on clay. 10/10 of their meetings have been on clay. For most, this would mean a 0/10 H2H. But Thiem has won three of their meetings. He’s the only player to beat Nadal on clay over the last two years, and he’s done it twice, both in straight sets. Thiem beat Nadal in Rome last year, 6-3, 6-4. He reached the pinnacle of aggressive baselining, pummeling the ball off both wings. Thiem must have had average ground stroke speeds above 80 mph or 128 kmh. Highlights below. This year he beat Nadal in Madrid, 7-5, 6-3. This was a more measured performance. Thiem served very accurately, and kept his cool throughout. Instead of slamming backhands down the line, he used them to spread the court beautifully. Unfortunately, despite these exceptional performances, there is no indication that Dominic Thiem could replicate in a best of five set match. Last year Thiem clobbered Djokovic in the quarters and came up against Rafa in the semi. Hopes were high. Rafa ended up winning 6-4, 6-3, 6-0, in a dramaless display. Playing Rafael Nadal in Phillip Chatrier Stadium is a whole ‘nother beast. There are four dimensions of Rafa’s playing to pay attention to. First, his serve. The good news for Thiem is that Rafa isn’t serving that well. Against Del Potro, his serve hardly helped. This was particularly clear in the first set against Del Potro, allowing the Argentine to go up 0-30, 0-40, 0-30 in Nadal’s first three service games. And despite his low first serve speeds, he only made 61%, and won 73%. Unfortunately, Nadal performed exceptionally well in every other dimension, and wasn’t broken in the match. Rafa sometimes drops his forehand short. Not against Del Potro, despite the nuclear blows off of Del Potro’s strings. Rafa sometimes struggles to get angles on his backhand. Not today, he opened up the court beautifully. Lastly, Rafa always shows pretty great tactical awareness. There is no doubt he will bring it on Sunday. Against Del Potro, he played incredibly well on the important points. Usually that means attacking his opponent’s backhand mercilessly. But he did more than that. He served and volleyed. He noticed Del Potro’s deep court position and hit some deft drop shots. He had exceptional spin control on his backhand, looping it high into Del Po’s backhand to catch the Argentine off guard. This last tactic will be crucial against Thiem, who exploited cross-court forehand to backhand combinations in Madrid. Nadal’s vast array of threats makes Thiem’s job endlessly complicated, and at once, simple. For Thiem to win this match, he won’t need to think. In fact, he’ll need to not think and just ‘tree’, e.g. hit with abandon like he did in Rome. No need to watch for subtlety in his groundstrokes, just raw power. A more instrumental and subtle thing to watch is Thiem’s serve. He’s abbreviated the motion– I believe for more versatility, disguise and better flat serves. (injury avoidance as well?) This took away a bit of the consistency of his kick, but has been a net benefit. Second, watch Thiem’s court position. Thiem has a tendency to get hopelessly mired deep. This tournament he’s been very aggressive and forward in the court, so good news there. But the crucial point is returning Nadal’s lefty serve. When Thiem has lost to Nadal, he has return from too far back . Some claim it’s lack of tactical awareness. I think it’s not so complicated– perhaps he just doesn’t feel confident feeling his backhand on the day and is thus doomed to stay back. Either way, he’ll need to be near the baseline for the return, or else Rafa’s one-two punches will stagger him. Rafa in three, with one tiebreak. Nadal’s better on a clay court than anyone who has ever lived. Currently his confidence, tactical awareness, and baseline game is unmatched. He demolished Del Potro in the semis, and will take down Dominic Thiem in the final.